"Ciak! I may be late a few days but here I am!" This is not my baby brother. It's my newborn cousin. See! cute and cheeky like me, ya . Congratulation to Kaw Kaw Lay Liew and family! Haiyor...made me so excited when I saw the link on Facebook... Thought mama has a new baby liao!!! Chesh! But come to think of it, would you want a baby brother to play with, kucing? Or a baby sister? Wink! Wink! LOL!!! Sometimes how nice if adults can be reminded of baby's traits, no hatred, no envy, no resentment, no revenge, wouldn't it be nice that way? Hahaha so cheeky! And cute! Hope the next baby you blog one is yours! super cute. congrats to the mom and dad. so cute :) nice photo too ... they really are adorable at that age kan? At first the baby belongs to you, scare me, thought so big surprise ....hahahhah! Cute and chubby baby. Looks a bit like smallkucing lah :) Congrats to the proud parents! 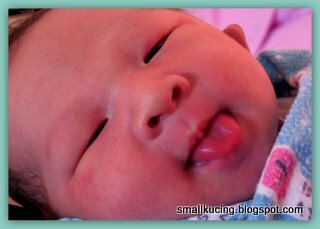 Wah, how you make the baby post with the tongue sticking out? Aiya, I thought Mamarazzi new baby!